Playing with paper boats in water puddles is a favourite sport of children but what happens when the same water engulfs and floods their homes and surroundings? They lose their precious innocence in such calamities. This story is about how material adds a soothing touch to children traumatized by a devastating disaster. The Bihar floods in 2008 weren’t ‘floods’ actually. Flooding means the river water is over flowing into the land and then receding after some time. In Bihar, the Kosi river actually changed its course and started flowing on a different path, submerging many areas. The water in Supaul, Araria, Saharsa, Madhepura, Khagaria, Bhagalpur, and Purnea districts did not recede for many weeks, resulting in widespread hunger and diseases. Needless to say that worst affected were the children. Unable to express their shock and trauma kids usually go silent at such times, for them the relief needs to go beyond just food and shelter- it needs to connect them back to their childhood innocence. After extensive relief work in the area our team couldn’t help but notice the blank eyes and expressions of the children in many villages it visited. This became the genesis of the ‘Chehak’ centres, solely to nurture the innocence of children in tough times. Chehak (चहक) means the chirping of the young ones of the birds. The first Chehak centre was started near a railway line where some kids gathered. There was a need to create a stress and trauma free space for introducing learning and basic behavioural aspects to many, who had never been to a school. It was also a timely support for the parents who were busy rebuilding their lives and homes. Soon, Goonj opened 16 Chehak centres across many flood hit areas. The initial plan was to open these centres for two months, till the water receded, but the communities ran them for more than two years instead! We turned them into happy colorful spaces filled with toys and other recreational material apart from hiring local teachers initially. This story is as much about the centres created for rehabilitation as it is about the lives of the children who came here and the people who made these centres. Kiran, a 14-year-old girl from Badhgaon, Saharsa (Bihar) would probably be tagged as a problem child in a school. She was embroiled in everyday fights, used foul language and was generally a cause of great disturbance for her parents, neighbours and peer alike. When we motivated her to join the Chehak centre, initially everyone there also faced the same issues with her. Over the months, with care and attention there was a marked improvement in her behaviour as she turned out to be one of the most sincere and bright students at the centre. With great joy and pride her mother would share about the changes in Kiran’s personality and her focus on studies. From a nuisance to a role model, Kiran’s journey is an inspiration and learning for all of us. Jaishree’s story perhaps best exemplifies our belief that giving things as ‘charity’ to children can leave a bad feeling on their impressionable minds. When Jaishree, a regular and sincere student at a Chehak centre, was handed some clothes, she had mixed feelings. Happy but confused, she wasn’t sure why she had received this favour, wondering if it was only because she was poor!! Her fears were laid to rest only when her teacher explained that the clothes were a reward for her good behaviour and recognition of her dedication and hard work in studies. This simple explanation gave Jaishree a sense of pride and dignity in wearing her clothes. The Chehak centres were a result of many small but sustained efforts on the ground; like a uniform curriculum and study material evolved for all centres and a basic annual exam for all children and teachers. These children were also involved in many social awareness campaigns in their villages like Prabhat Pheris, sanitation drives, Bihar Diwas etc. apart from sports competitions. Some children from Chehak centres also travelled to Delhi to participate in Goonj’s ‘School to School’ event- Pratibimb. Back in 2005, Pratibimb started with a desire to bring the children from two ends of India; in the villages and the cities, face to face, to become friends and learn about each other’s lives. Thus started an annual three day interaction in Delhi, attended by children from villages of Bihar, Madhya Pradesh, Uttarakhand, Andhra Pradesh and many other states. They met with children from some of the best city schools. Since then Pratibimb has evolved as an annual coming together of children from two very different worlds, engaged in a unique exploratory dialogue. For the village kids this is a platform to express and showcase their talent and get exposed to different opportunities. For the city kids who are used to a life of abundance, this is a great opportunity to learn the true value of all that they have.. It teaches them empathy, dignity and equality from children who have very little. The important aspect is that the entire interaction happens on an equal footing, with a premise that all kids are equally talented; some just don’t have the opportunities and the resources to shine through. Like most other Goonj initiatives the Chehak centres also grew as a result of active participation and ownership of the local communities. People not only pro-actively made these centres but also contributed land, soil, bamboo and shramdaan (voluntary labour). After heavy rains, many times people first repaired their Chehak centers even before repairing and rebuilding their own homes. The people of Govindpur Goriyari village in Bihar even made a bamboo bridge under Goonj’s ‘Cloth for Work’ initiative so that their children could reach the Chehak centre on the other side of the river. In Bihar an interesting connection also emerged between the Chehak centres and Goonj’s Vaapsi initiative (giving skill-based material kits or tools to the disaster hit people.) We asked some people who received the Barber Kits under the Vaapsi initiative, to give a free haircut to children at the Chehak centres as a payback for their kits. The recipients of Carpentry Kits helped make tables and chairs for these centres as pay back. People who got rickshaws and thelas (wheel cart) collected ₹15 a day for a year to their local Chehak centre towards the fund for the fees of the centre teachers. This cross involvement model ran effectively for a year while over 1,200 kids in the age group of 3-16 years came to the Chehak centres. 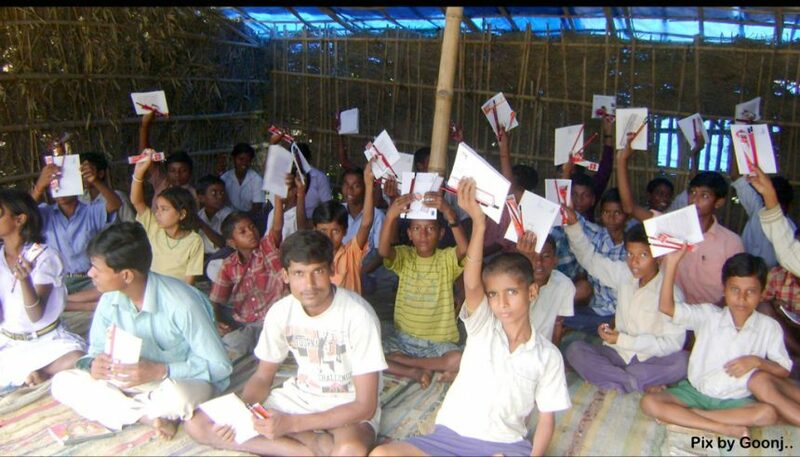 Even today there are two operational Chehak centres in Saharsa district of Bihar, with over 90 kids in total. Initially, the parents gave ₹30-40 per month as a step towards taking complete ownership of the centre. Now these centres, run by their village, act as informal tuition centres complementing the formal government school education for the children. Looking at the marked improvement in their children’s learning, parents are now happy to pay ₹100 as monthly fee while Goonj continues to support these centres with material. In early 2015, just after the twin disaster (cyclone and earthquake) hit Purnea district in Bihar, Goonj again started a Chehak centre in the area. 43 local villagers mobilized their resources to create a bamboo structure for the centre while Goonj provided all the necessary support in terms of chairs, benches, stationery and books etc. Today 75 kids are enrolled at this centre. “Personally it gave me immense pleasure when I saw a group of little students coming in a boat to the coaching centre at Moti Mohalla Dal Lake (Srinagar). One could easily see how desperate these children were, crossing the lake in zero degree temperature when it almost freezes,” Samreen from Goonj’s J&K team shares her feelings around running a Goonj coaching center for the children affected by the 2014 devastating floods in the valley. The idea was to fill the huge gaps due to closure of schools after the floods. Over 1200 kids benefitted from this initiative.